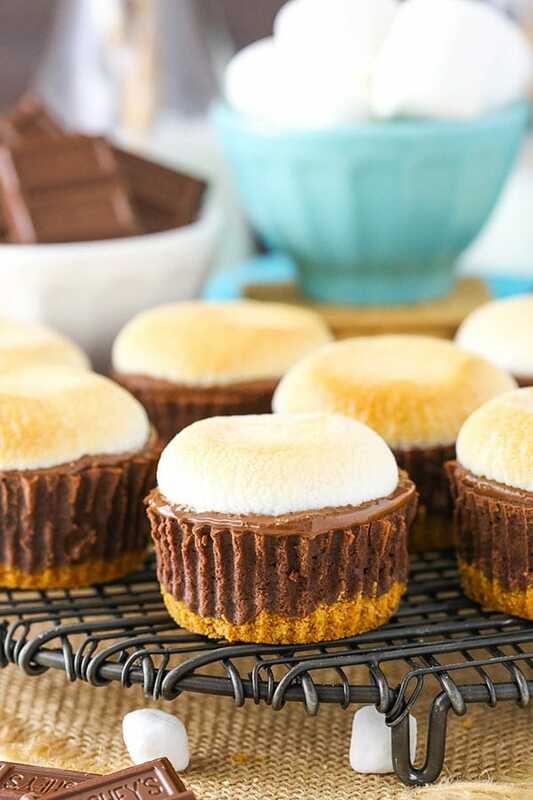 These Mini S’mores Cheesecakes are made with a graham cracker crust, chocolate filling, melted chocolate and toasted marshmallows on top! They are such a fun treat for fall – with or without the campfire! So a couple of weeks ago, the hubs and I got a new family car. With two kiddos on the way and a car that was acting up, we decided to just make a change. I totally love the car, but when I had to clean out my old car, the salesman reminded me to check my CD player. It was a great recommendation, because I’d totally forgotten. Naturally when I hopped into the new car, I went to put my Michael Jackson CD in the new CD player and realized for the first time that there wasn’t one. How in the world will I listen to all my awesome old-school CDs?! I feel like a total old person all of a sudden! I miss my CDs! I know we all listen to music on our phones and other devices now, but I still have some rockin’ jams that I have no idea how to listen to now. 🙁 I’m told there are apps I can download, but it sounds like I either have to re-purchase all the music or buy another subscription to another service. I’m not a fan. Technology is a serious mixed blessing, am I right? Another classic – which isn’t going anywhere any time soon – is the s’more! The combination of graham cracker, melted chocolate and melty marshmallows is just so good! And I’m loving them in mini cheesecake form! To start, we’ve got the classic graham cracker crust. Obviously a must-have. They are pre-baked in little cupcake liners. Next up is the cheesecake filling. It’s full of chocolate flavor, thick and creamy! I don’t know about you, but I’m all about my cheesecake texture and thick and creamy is the way to go. Fill the cupcake liners pretty much to the top, then bake. One nice thing about mini cheesecakes compared to full sized ones is that they don’t need a water bath and they cook much more quickly. Score! 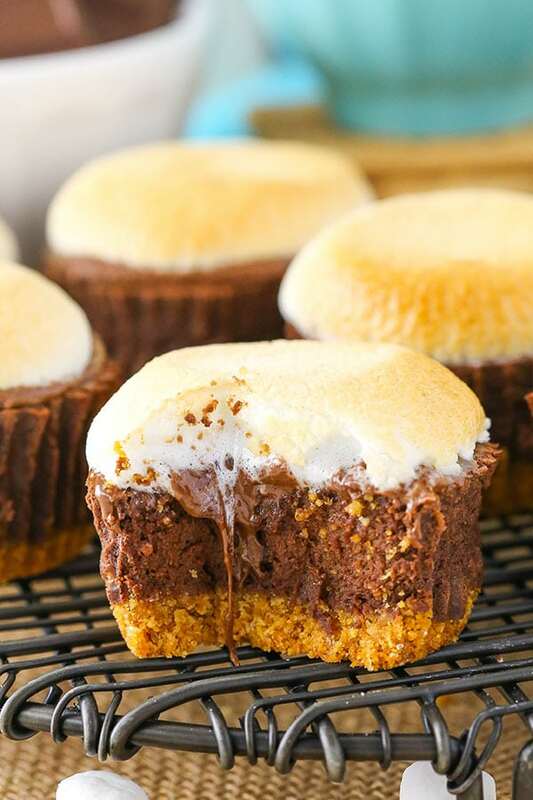 Once the cheesecakes are baked and cooled, top them with a couple chocolate rectangles and a marshmallow and broil them for a few minutes until the chocolate is melty and the marshmallows are starting to brown on top. 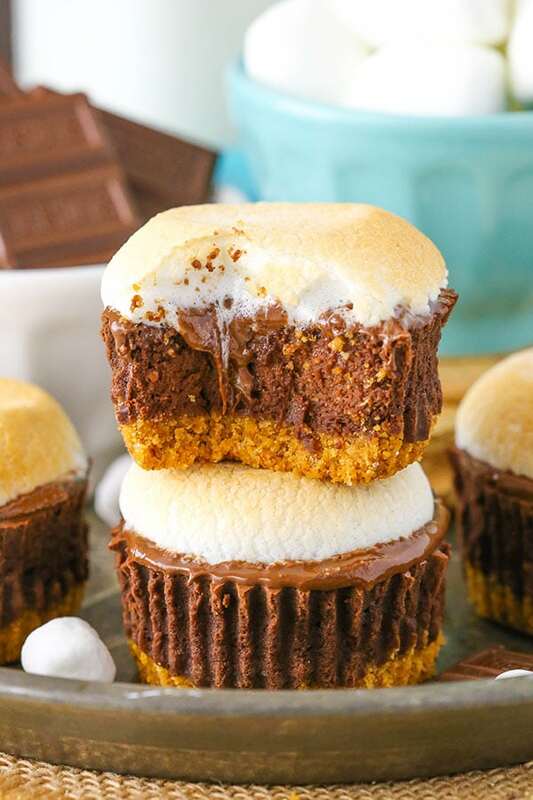 I personally would suggest serving these just after melting the chocolate and marshmallow, since that’s when they are most s’more-like and tasty! Of course if you refrigerate them, you can always heat them back up as you feast on them one at a time, if that’s your plan. 🙂 Either way, I hope you enjoy them as much as we did! 2. Combine the crust ingredients and divide the mixture between the cupcake liners (about 1 1/2 to 2 tablespoons per cup) and press into the bottoms. 3. Bake crusts for 8-10 minutes then remove from oven. Allow to cool while you make the filling. 2. In a large bowl, mix the cream cheese, sugar and cocoa powder until combined (Use low speed to keep less air from getting into the batter, which can cause cracks). Scrape down the sides of the bowl. 3. Add the sour cream, vanilla extract and milk. Beat on low speed until well combined. 6. Bake cheesecakes for 15-17 minutes, then turn off oven and leave the door closed for another 15 minutes. 7. Crack the oven door and allow cheesecakes to cool for 10 minutes, then put in the fridge to finish cooling. 8. Once the cheesecakes are cooled and firm, place a couple rectangles of chocolate on top of each, then a marshmallow. 9. 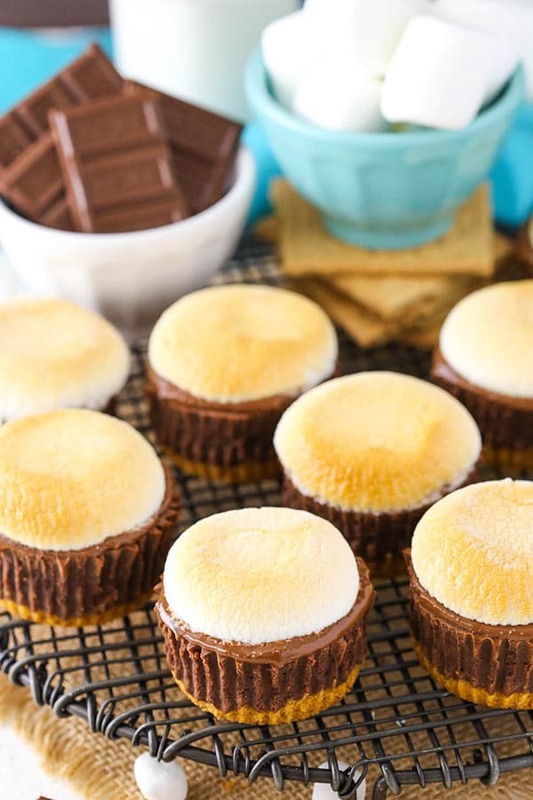 Place the cheesecakes on a cookie sheet and broil until the chocolate is melted and marshmallows are lightly browned. 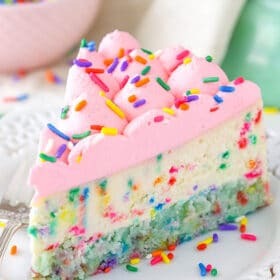 Cheesecakes are best if served immediately. Leftovers can be refrigerated for 3-4 days. So fun! Would love to try this out!! I completely understand the whole CD thing. Besides having tons of CDs, I listen to audio books on my commute to work each day (it’s 30-45 minutes each way). I have a 6 disc CD player (factory) in my truck. When I bought the truck I thought it was overkill. Who needs to play 6 discs at once??!! Now, I can’t imagine life without it. And it’s already died once and the replacement is trying to die. But they don’t make after market changers anymore and the OEM stereo is almost $1000! :'( Thankfully they are still available on ebay! My husband has been wanting me to get another vehicle that’s more gas friendly and since he doesn’t drive more than a couple miles for work, he would get my truck. So we go to look at a Kia Niro (it’s cute and gets 51 MPG in the city!). There’s no CD player. I ask the sales guy if that was an extra. After his initial shock of a CD player in the car, he tells me that by 2018 almost no vehicles will have CD players! What?! I don’t think I’m old, but now I really feel old. *sigh* I totally understand the need for CD players. 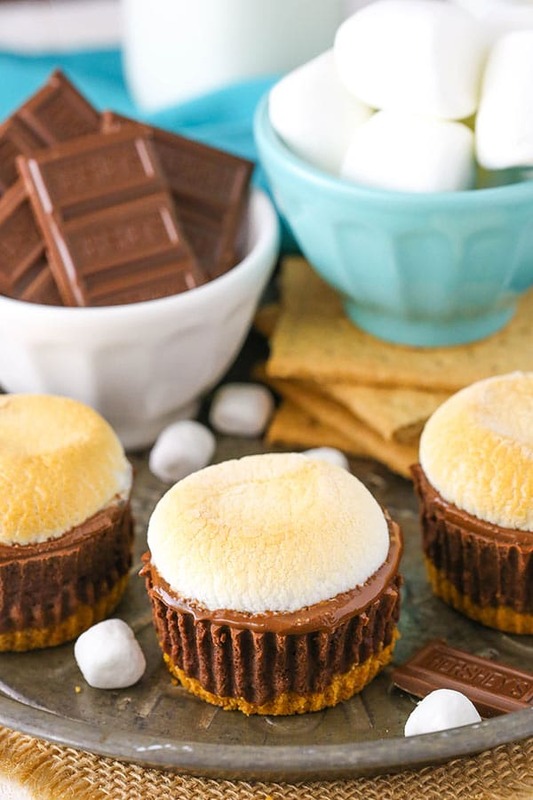 Oh, and the s’mores cheesecakes look delicious. I can’t wait to make them! You totally feel my pain. 🙂 Not cool! Yep I would be lost without a CD player in the car! I don’t like that I have to buy all my music again if I got a new car! But I do like your S’more cheesecakes! Another brilliant recipe! 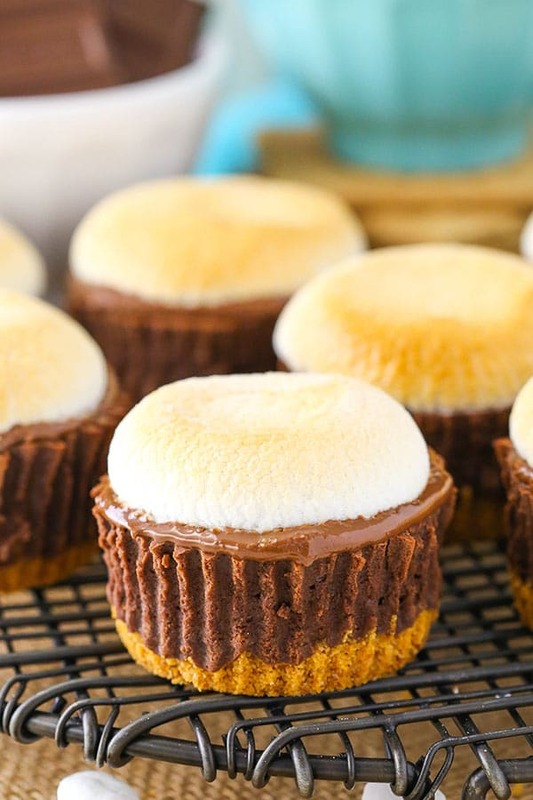 These s’mores cheesecakes look amazing. I cannot wait to try them. 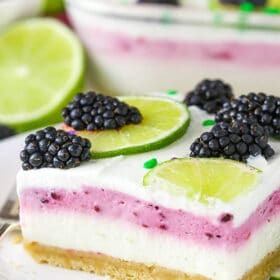 I just came across your blog and I am blown away at your amazing recipes. And the photos are incredible..love love your blog. I am going to bake everything here I see. And thank you for sharing these awesome recipes. I’m glad you found the blog! I hope you enjoy the things you try! These look so mouthwatering yum! I made these for a baby shower. They were wonderful. 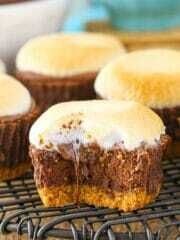 I made them as mini cheesecakes without the papers in a removable bottom pan. The mini cheesecakes baked for 12 minutes and then I left them in the oven for 12 minutes. I made my own marshmallow topping that I piped on the top and then torched. It was beautiful in the end. The only problem I have with this was that they had to be made right at the last second to have the hot gooey chocolate that you want from a s’more. Otherwise you end up with hard chocolate under the marshmallow. I decided that next time I would try making a chocolate ganache instead of the piece of chocolate. That way I can make them ahead of time. Thank you so much for another amazing recipe.